T cells (also called T lymphocytes) are one of the main components of the adaptive immune system. They are vital in hosting an immune response against pathogens. T cells play a major role in defence against intracellular pathogens such as viruses, protozoa and intracellular bacteria, and in immunity to extracellular pathogens by providing help for the antibody response. This article shall discuss the production of T cells, the different types present in the immune system and relevant clinical conditions. T cells originate from haematopoietic stem cells which are produced in the bone marrow. These stem cells then split into 2 progenitor groups, myeloid and lymphoid progenitor cells, the latter of which then differentiate into T cells and B cells. T cells then migrate to the thymus gland, in the anterior mediastinum, to undergo the process of maturation. They enter the cortex and proliferate, mature and pass onto the medulla of the thymus. From the medulla, mature T cells enter the circulation. These mature T cells are now capable of responding to antigens in the periphery. The thymus shrinks as we age and so provides fewer T cells over time. As such, the older a person becomes, the more important T cell expansion in the periphery becomes in providing immune protection. Fig 1 – Diagram demonstrating the cells of the immune system and the progenitor cells they are derived from. There are 4 main types of T cells. CD4+ helper cells help in the maturation of B cells into plasma cells and memory B cells. They also help activate cytotoxic T cells and macrophages. They become activated when they are presented with peptide antigens by MHC Class II molecules, which are expressed on the surface of antigen presenting cells (APCs). Once activated, they divide rapidly and secrete small proteins called cytokines that regulate or assist in the active immune response. There are various subtypes present within the immune system that are able to secrete different cytokines depending on the immune response occurring, however these are beyond the scope of this article. CD8+ cytotoxic cells cause lysis of virus-infected and tumour cells. They are also involved in transplant rejection. These cells recognize their targets by binding to antigen associated with MHC Class I molecules which are present on the surface of all nucleated cells. Once they come into contact with an antigen naive T cells differentiate into effector cells (CD4+ and CD8+ cells) and memory T cells. Memory T cells are long-lived and can quickly expand to large numbers of effector T cells upon re-exposure to the antigen. They provide the immune system with “memory” against previously encountered pathogens. Memory T cells may be either CD4+ or CD8+. They bridge the adaptive immune system with the innate immune system. Whilst most T cells function based on recognition of MHC class molecules, natural killer T cells are able to recognise other antigen classes. Once activated they are also able to perform the same functions as CD4+ and CD8+ cells. 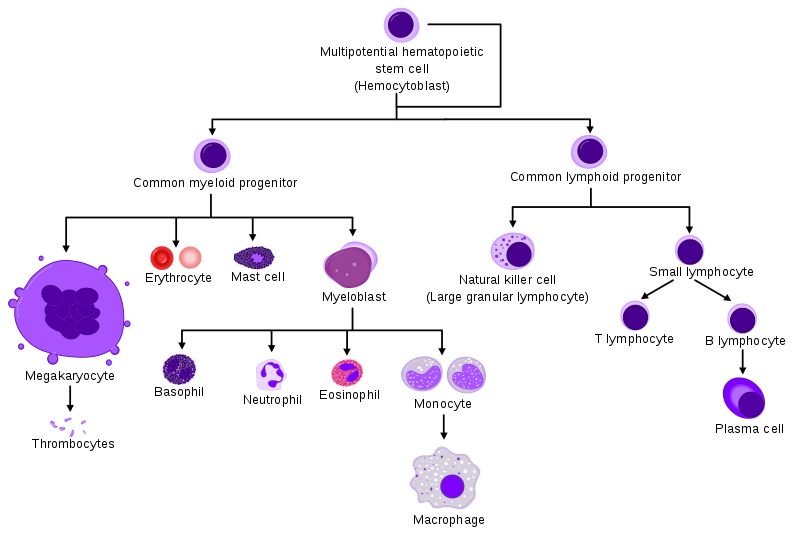 These cells are distinct from natural killer cells. Fig 2 – Diagram showing some of the different classes of T cell and their function in the immune system. The foreign antigen is transported to lymphoid tissues by Antigen Presenting Cells (APCs). The APC processes the antigen and displays it as a MHC molecule on its cell surface. 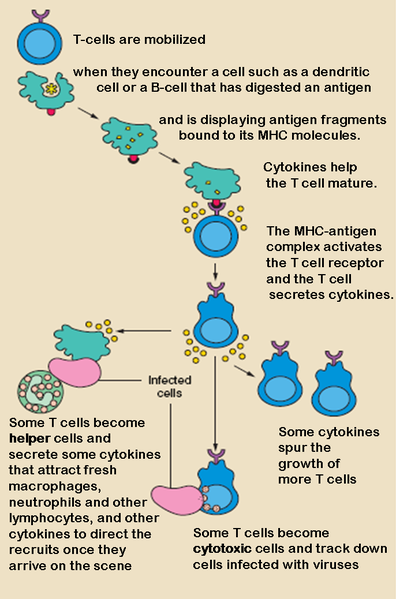 The T cell then recognizes the MHC using its T cell Receptor and becomes activated. After activation, the T cell secretes cytokines to directly attack infected or cancerous cells, and stimulate growth of more T cells. Some T cells will become cytotoxic T cells to attack virus-containing cells, and others become memory T cells in preparation for future infections. 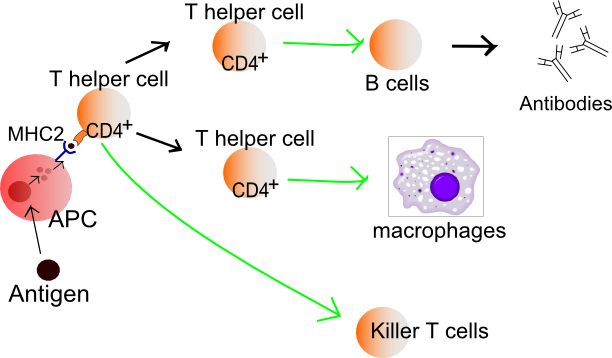 Fig 3 – Diagram summarising the process of T cell activation. Note that some T cells will also differentiate into memory T cells. There are many causes of T cell deficiency, such as lymphocytopenia and Severe Combined Immunodeficiency (SCID). Di George Syndrome, where there is thymic aplasia (thymus fails to develop) can cause partial T cell insuffiency. Fungal infections are also more common in T cell deficiencies.